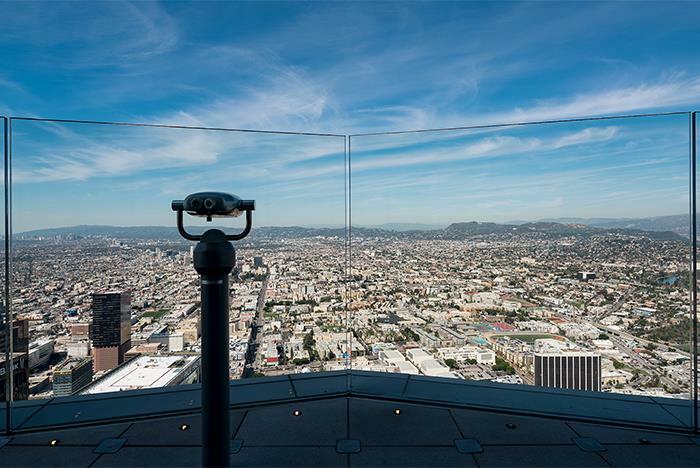 Look out over Los Angeles’ in California’s tallest open-air observation deck for unparalleled views of the city. This unobstructed, 360-degree view of the city is unlike any other and offers its fair share of thrills and interactive exhibits for guests to engage with. If you dare, experience the world’s first Skyslide and go from the 70th floor to the 69th floor — while outside of the building! 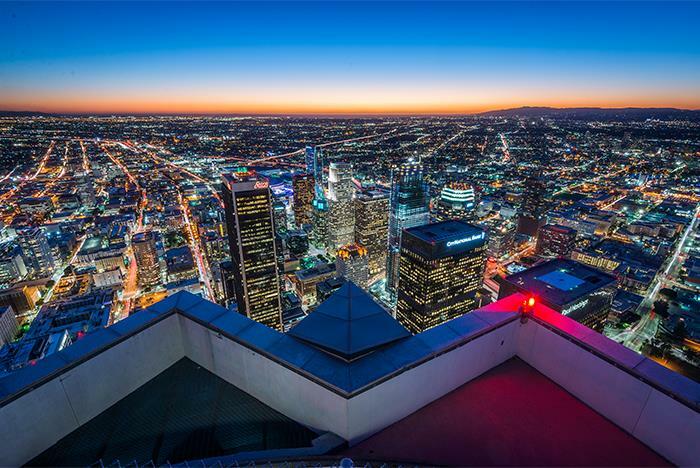 Bring your camera for a one-of-a-kind view of the Los Angeles skyline and cityscape. Grab-and-go food and beverage items are available for purchase at the Skyspace Bar. OUE Skyspace Observation Deck is open rain or shine. Parking is available for a fee at 524 S. Flower Street, Los Angeles, CA 90071. Take LA to New Heights! 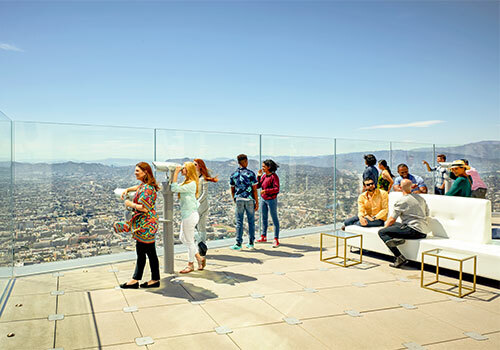 OUE Skyspace is the perfect starting point for guests to the Los Angeles area providing a stunning overview of the city’s layout, allowing you to map out other various options to be explored on your trip.OUE Skyspace is a living story, with the guest at the heart of our story. 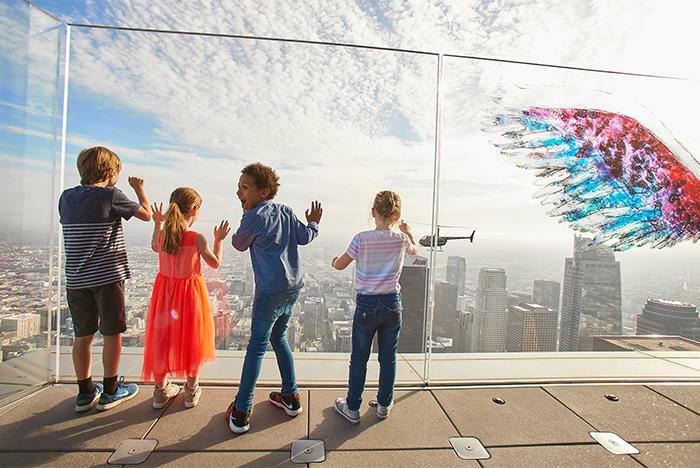 We look to inspire play, wonder, and curiosity as each visitor is able to see Los Angeles from a whole new perspective, 1,000 feet in the air. 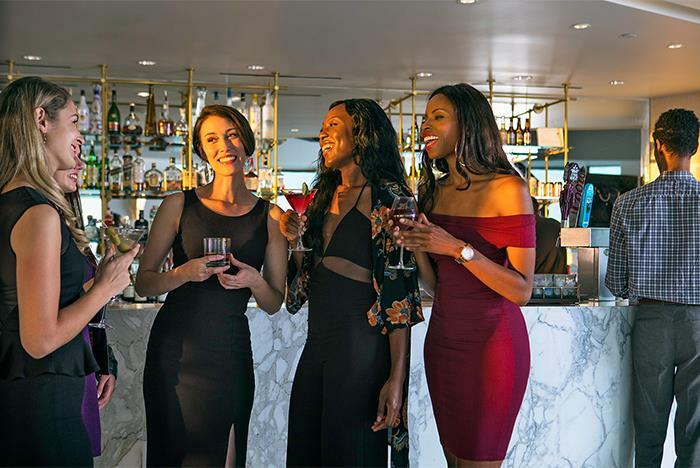 To complement your experience, you will be able to enjoy a culinary experience that represents the vibrant components of the city, from the food and beverage to our signature cocktail programs, each is an extension of the culture of the city. 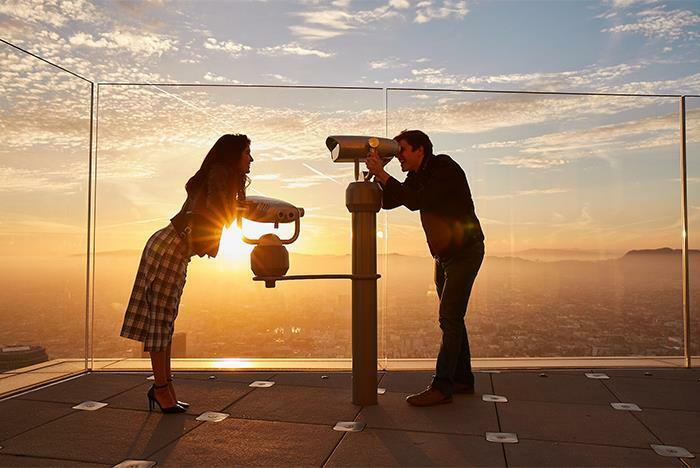 Soak in the Sun - Enjoy LA’s unparalleled 360° views from California’s tallest open-air observation terraces and see iconic landmarks such as the Hollywood Sign and Capitol Records. For sports enthusiasts, get a bird’s eye view of Dodger Stadium, Staples Center, Banc of CaliforniaStadiumand The Coliseum. Walk around and enjoy the scenic landscape looking north to the San Gabriel Mountains, west to the Pacific Ocean and south to Catalina Island. Discover LA experience legendary stories in a fully immersive and reimagined way through dynamic storytelling touchpoints. Learn about Los Angeles and your Skyspace journey in a 360 theatre, strike a pose as you live a day in the life with a red-carpet experience, listen & learn the history of music in LA, take a peek behind the curtain with some of the most iconic sports brands and create your own graffiti art on 3 interactive screens. Ride the Slide - Do you have what it takes? Experience the Skyslide, a 45-foot, fully enclosed, all-glass thrill ride. 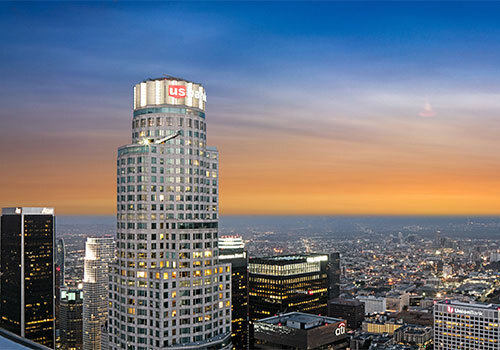 The Skyslide is positioned on the exterior of the US Bank Tower nearly 1,000 ft. above Downtown LA. Experience the city from an entirely new perspective! Experience DTLA - Skyspace LA is conveniently located at the heart of Downtown LA which hosts many attractions and museums such as The Grammy Museum, The Broad Museum, Grand Central Market, Angels Flight, and Olvera Street shopping. On May 17th, 2019, the last entry will be at 2:30PM. On May 18th, 2019 Skyslide last entry will be at 8PM. OUE will be CLOSED on May 28th, 2019. Where is OUE Skyspace Observation Deck located? OUE Skyspace LA is located on floors 69 and 70 of the iconic U.S. Bank Tower, nearly 1,000 feet above downtown Los Angeles. The address for the U.S. Bank Tower is 633 West 5th Street, Los Angeles, CA 90071. How many stories/feet high is the OUE Skyspace Observation deck? 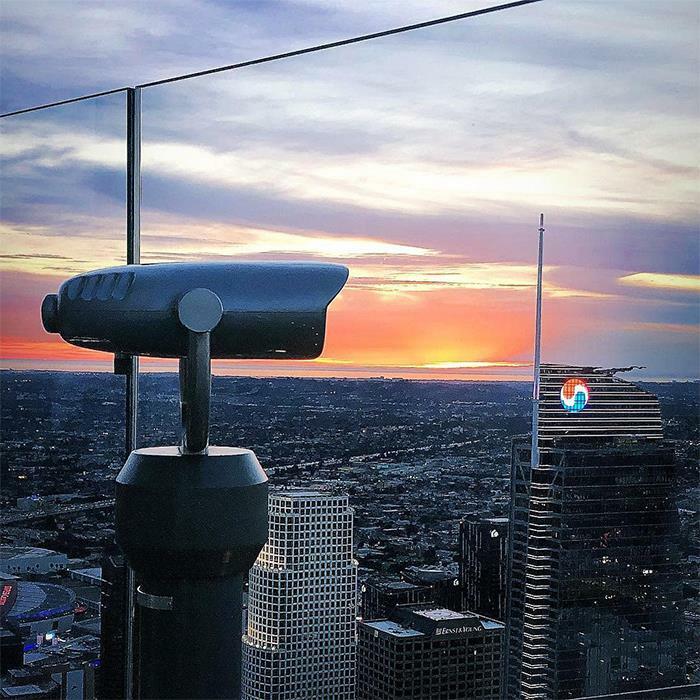 The OUE Skyspace LA observation deck is located on floors 69 and 70 of the iconic U.S. Bank Tower, nearly 1,000 feet above downtown Los Angeles. Is this a family-friendly attraction? Are age restrictions in place? 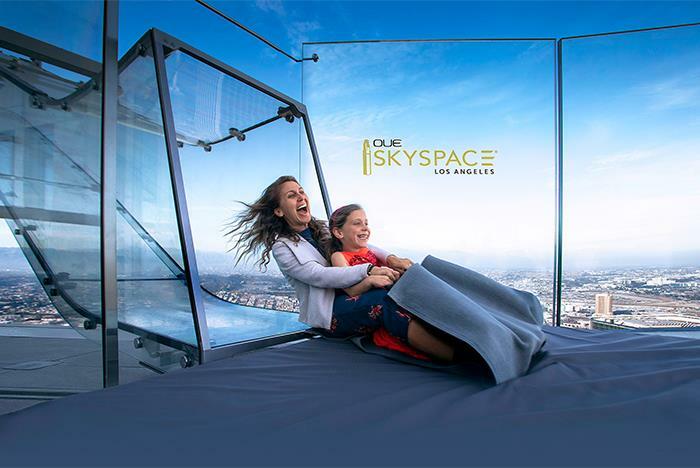 OUE Skyspace is the ideal family-friendly attraction, suited for all ages. Children and adults of all ages are welcome to visit the observation deck. However, there is an age restriction of 5 years old to ride the Skyslide. Minors under 18 years of age must be accompanied by a ticketed parent or guardian during their visit. OUE Skyspace is open daily from 10:00 am-10:00 pm with last entry at 9:00 pm. Are food and beverages available for purchase at the observation deck? 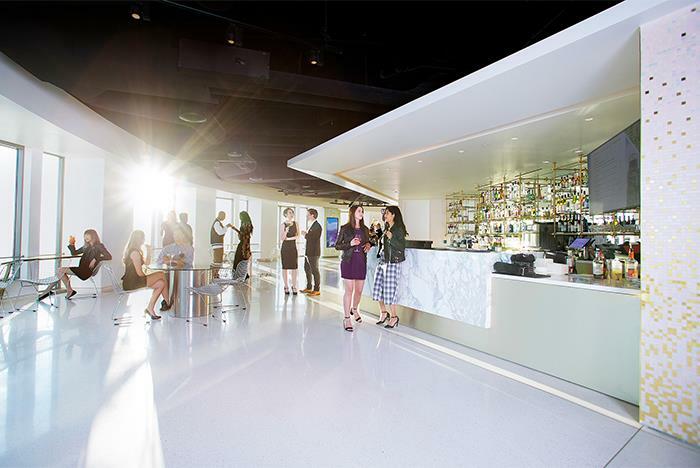 The Skyspace Bar is open to all visitors during business hours. There you can purchase lite bites, grab and go sandwiches, beverages, and cocktails for guests 21+. Food and beverage are allowed on the outdoor terraces in provided containers. OUE Skyspace LA is open daily, rain or shine. In the event of severe weather systems, Skyslide and the outdoor observation decks may be closed briefly in the interest of guest and associate safety. What can’t I bring into Skyspace? Luggage, markers, tripods, outside food and beverages, tools, pocket knives, lighters, pepper-spray/mace, commercial camera or audio recording equipment and emotional support animals/pets. Strollers are permitted in the attraction, however, we ask that you remove the child and collapse the stroller while in the attraction’s elevators. What if I just want to ride the Skyslide? 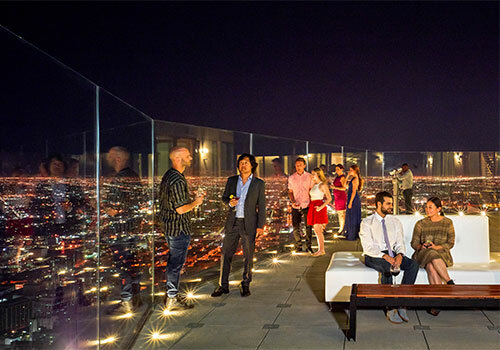 All guests must purchase a ticket to access OUE Skyspace LA. Once inside the attraction, you may purchase as many Skyslide passes as you wish. What is the Skyslide made out of? 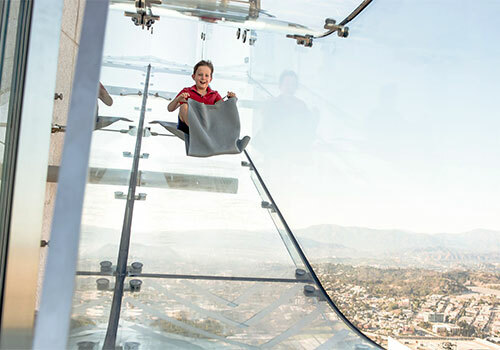 The Skyslide is made entirely of clear glass, 1 ¼ inches thick, and extends forty-five feet long, from the 70th floor to the 69th floor of the U.S. Bank Tower. The entrance to the Skyslide is approximately four feet wide. What are the health restrictions for riding the Skyslide? Guests who are pregnant, think they might be pregnant, have any history of high blood pressure, heart conditions, back/neck/bone injuries or recent surgery or illness are discouraged from riding and do so at their own risk. Can I ride the Skyslide with a friend? Only an adult and children between the ages of 5-10 years of age may ride the Skyslide tandem style. Can I bring my personal belongings on the Skyslide? It is highly recommended that personal belongings be left with a non-rider. Riders must have both hands free during their ride. Small items may be placed in the lap of the rider. Larger items may be placed in small bags that the rider can wear as a backpack during their ride, which must be returned to the Slide Ambassador at the bottom of the slide. Please keep in mind, Skyspace LA is not responsible for lost, stolen or damaged personal property, including items transported in this manner. Is the Skyslide air conditioned? How do I ride down the Skyslide? All guests ride down the slide on specially-created mats that will increase the speed and thrill-factor of the ride while also providing a barrier to the glass. Can guests in wheelchairs ride the Skyslide? Yes. The Skyslide has been designed to accommodate guests in wheelchairs. Lift equipment has been installed to assist guests in transferring from the Skyslide back onto wheelchairs.